AKRON, Ohio -- A large contingent of family and friends cheered loudly for Andy Oliver from just beyond the third-base dugout at Canal Park, welcoming the Erie pitcher home last week. Although Akron isn't exactly home, it's an Ohio city and not that far from Oliver's native Vermillion -- which proved close enough for the left-hander's family and friends, who happily made the short road trip to get their first peek at Oliver as a professional. 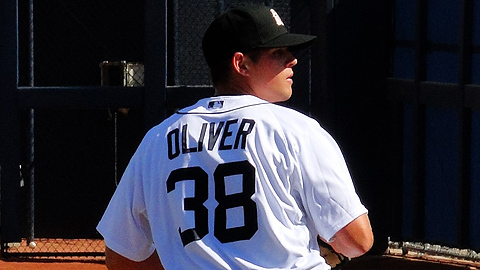 After the Detroit Tigers selected Oliver in the second round of last summer's Draft, he played briefly in the prestigious Arizona Fall League with Peoria (1-1 with a 2.81 ERA in 11 appearances) before making his pro debut at the Double-A level in April. There's no doubt Oliver is on the fast track to the Major Leagues, even if he's not yet riding the express train like some of his fellow Draft mates from last summer. Nonetheless, Erie manager Phil Nevin believes Oliver could become one of the best pitchers in the Majors over time. "There are arms from the Draft last year that are in the big leagues already," Nevin told the Elyria Chronicle-Telegram. "Stephen Strasburg and Drew Storen are both playing for Washington, and Andy has the chance to be as good if not better than both those guys. We're taking the right path for Andy Oliver." That path has had its ups and downs already. Oliver struggled in his debut, a 7-4 loss to Binghamton in which he lasted just 3 2/3 innings and gave up six runs -- five earned -- on six hits and four walks. He finished April at 2-1 with a 5.03 ERA in four starts. But a concentration on and improvement of his slider helped him go 3-1 with a 2.36 ERA in six May starts. "[Overall] it's all been going pretty smooth," Oliver told the Chronicle-Telegram after a 5-1 loss to the host Aeros on June 2. "The organization is showing confidence in me, and that's allowing me to believe in myself." Although Oliver took the loss against Akron, his counterpart -- right-handed pitcher Alex White, who was the Indians' 15th overall pick in last year's Draft -- was impressed by Oliver's craftsmanship. "He's got great stuff and some good pitches," said White, who earned the win to improve to 2-1 with a 1.83 in three starts at Akron after starting his pro career at Class A Advanced Kinston. "It was pretty obvious tonight that he can dominate any team." Monthly honors: Trenton 3B Brandon Laird was named Eastern League Player of the Month for May. Laird batted .339 in 29 games with nine doubles, one triple, six home runs, 33 RBIs, 25 runs scored, a .591 slugging percentage and .374 on-base percentage. Laird, the younger brother of Detroit Tigers C Gerald Laird, recorded 12 multi-hit games during the month, including 10 games in which he drove in two runs or more. The highlight came May 26 when the 22-year-old completed the cycle with a two-run walk-off homer in a 7-6 win against Erie. Weekly honors: New Hampshire 3B Shawn Bowman was named Eastern League Player of the Week for the period ending June 6. He batted .393 with two doubles, four home runs, 10 RBIs, seven runs scored, three walks and a .893 slugging percentage in seven games. The 25-year-old reached base in every game, had four multi-hit performances, scored at least one run in six of the seven games and put together his finest effort of the week Tuesday in Reading when he went 3-for-4 with a homer, four RBIs and two runs scored in a 12-10 victory. Bowman was acquired by the Toronto Blue Jays off waivers from the New York Mets on April 14. He ranks second in the league in OPS (.976), third in slugging percentage (.566) and fourth in both batting average (.317) and on-base percentage (.411). ... Trenton RHP Hector Noesi was named Pitcher of the Week over the same span. In a pair of starts last week, he went 2-0 with 14 strikeouts and a 1.38 ERA. In his first start Tuesday against visiting Portland, Noesi did not allow an earned run in six innings of work in a 6-2 victory. He struck out four batters while limiting the SeaDogs to just three hits in his first career Double-A win. The 23-year-old was equally impressive during his second appearance Sunday against visiting Richmond. He allowed only two runs on six hits over seven innings to earn his second win, striking out 10 batters along the way. He was originally signed by the New York Yankees as a non-drafted free agent on December 3, 2004. Jacks by the half-dozen: New Hampshire's offense set a franchise record with six home runs Wednesday, including two each by Adam Loewen and Danny Perales as the Fisher Cats rolled to a 15-5 win at Reading. Bye bye, Kalish: Portland OF Ryan Kalish was promoted to Triple-A Pawtucket Tuesday. The 22-year-old was batting .293 in 41 games for the Sea Dogs and led the team in runs scored (35), home runs (8) and stolen bases (13). He was also fourth in the Eastern League in both walks (28) and on-base percentage (.404) and fifth in stolen bases. On May 29, Kalish became the ninth player in team history to collect five hits in a game. Did you know? : Trenton RHP Robert Coello established a career-high with 11 strikeouts in a 1-0 loss to Trenton on Wednesday. Despite not earning a decision, Coello's 11 K's were the most for the Sea Dogs this season. ... LHP Dustin Richardson was the last Sea Dog to fan 11 batters, back on Sept. 1 vs. New Hampshire at Hadlock Field. ... Looking to climb out of the cellar of the Western Division, Akron won its sixth consecutive game Saturday with a 9-7 victory over host Harrisburg. A seven-run fourth inning brought 11 batters to the plate and powered the Aeros attack while the bullpen held on late.